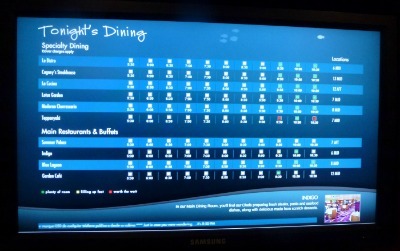 The Norwegian Pearl Restaurants - Are you concerned about the Extra charge restaurants on the NCL Pearl? The Norwegian Pearl offers 12 different dining options, which is why we choose Norwegian when booking a cruise. Some are included in the price of your cruise, and some are an additional fee. Sometimes this frustrates traditional cruisers, however WE LOVE IT! You make a reservation for dinner in the restaurant you want to eat in, dine with who you want to dine with, and when you want to dine. 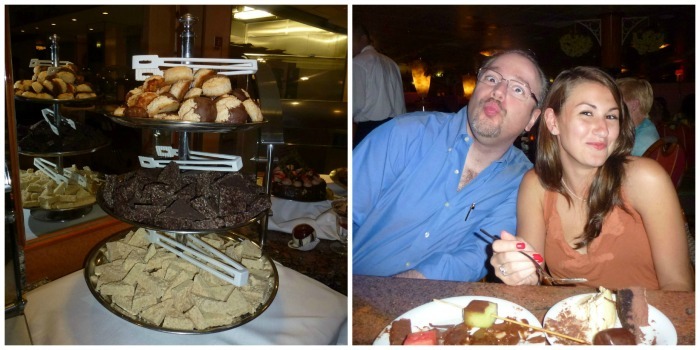 I will make one concession to our review/opinion of the Norwegian Pearl dining experience. 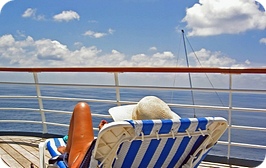 We usually travel in the suites on board, so it is REALLY easy for us to book reservations in the restaurants. We ask the Concierge to do it. This is one of the reasons we book in the suites. What we do love to see though are the boards around the ship with up to date information about what the availability is in each restaurant. We have heard some people that stay in some of the regular cabins, on a busy sailing, can have a hard time booking the more popular restaurants. Recently NCL launched a new system where you can pre book and pay for your dining and plan your week out before you get on board. Like booking your excursions before you board. They allow this within 45 days of departure. 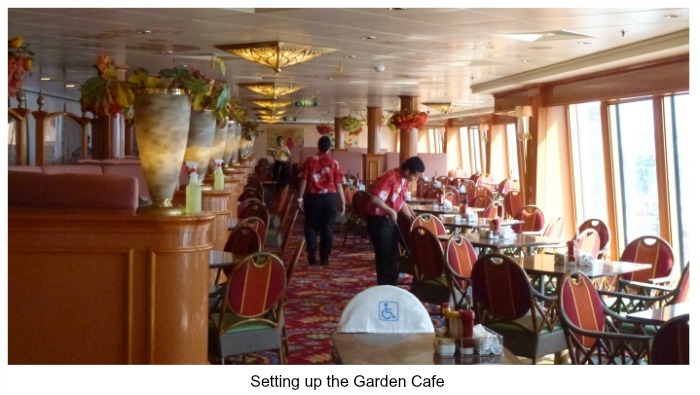 The Norwegian Pearl restaurants included in your cruise fare are the Garden Buffet, The Blue Lagoon, The Great Outdoors Bar, the Indigo Dining Room, The Sky High Bar & Grill and the Summer Palace Main Dining Room. Oh and of course, room service. We enjoy the Garden Buffet for a quick lunch or breakfast (if we aren't dining in our cabin or at Cagneys). The Blue Lagoon is great for late night snacks as it's open 24/7. If you are staying in a suite or have a certain level of latitudes status, then you can have enjoy breakfast and lunch at Cagney's. We love to do this if we want to spend the time have a long leisurely lunch. If you stay in the Courtyard Suites, Owners Suites or Garden Villas, and you have access to the Haven Courtyard, then you can eat breakfast or lunch here, and it's served from Cagneys. Don't forget to check out the late night chocolate buffet! It is included, but make sure that you get there early or you will miss the presentation, and all the good stuff may be gone! We love the Extra Charge Norwegian Pearl Restaurants. We love that you can eat in a different type of restaurant every night. 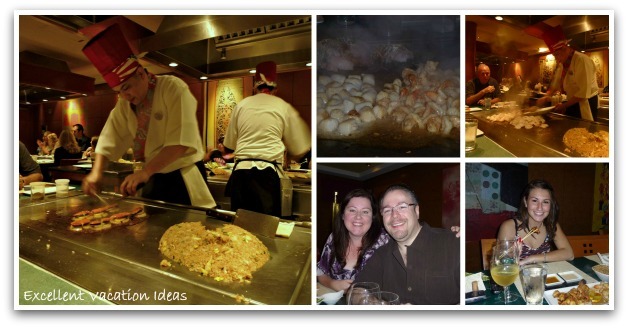 on our trip on the Norwegian Pearl, we ate at Cagney's (the steak house), Tempanyaki (Japanese), the Bistro (French), La Cucina (Italian), Lotus Garden (Asian) and our new favorite - Moderno Churrascaria (Brazilian). Some people think that it is silly to pay extra for these restaurants and that they should be included. However we completely disagree. We love how we can have a meal cooked to order for us, instead of the traditional dining room set up. We budget in meals in these restaurants and go knowing that we will have to pay. In fact we don't eat in the dining room at all unless we are asked by friends or their is a specific reason to. We love Cagney's and as always it is quite good. We have eaten in many steak restaurants and Cagney's is on par with a Mortons or Ruth Chris type steak house. Make sure you try their truffle fries! We also enjoy the Bistro, don't miss the chocolate fondue or their lobster dishes if you are a fan of lobster. 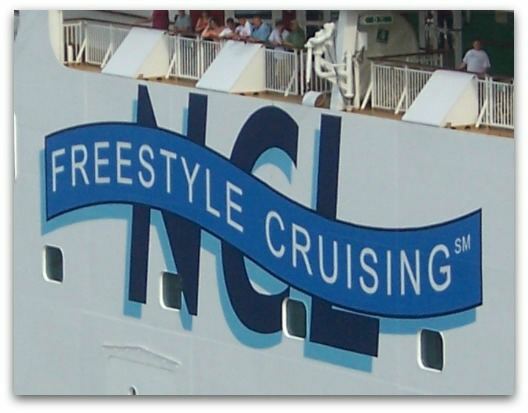 Before you go onboard, check with NCL to see if they have a anniversary package. 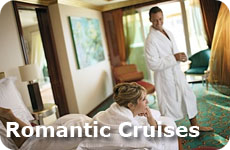 You can usually get the Bistro included with an Anniversary/Honeymoon/Romance package that can include dinner for 2, sparkling wine and strawberries in your stateroom, canapes, roses, portraits taken and/or spa packages. Tempanyaki is just so much fun, but make sure you book this early, as there are only 3 seatings and they sell out quickly! If you have never done this kind of dining (where the Japanese chef cooks in front of you) then this is a great place to try it! La Cucina, the Italian restaurant is one of my favorites as I LOVE antipasto. They don't disappoint here. It is a great option if you don't want to pay too much as it is usually about $15 a person. Lotus Garden is the same, it is a cheaper alternative and the food is really good if you like Asian fusion type food. Make sure that you ask your server what their favorite is, when we do it, it makes us try something different! You can also have sushi at the Lotus Garden or at the sushi bar in this restaurant. It is OK, and good to eat, but don't expect the quality of a New York or California type sushi restaurant, after all they are at sea and can only pick up produce and fish in certain ports. 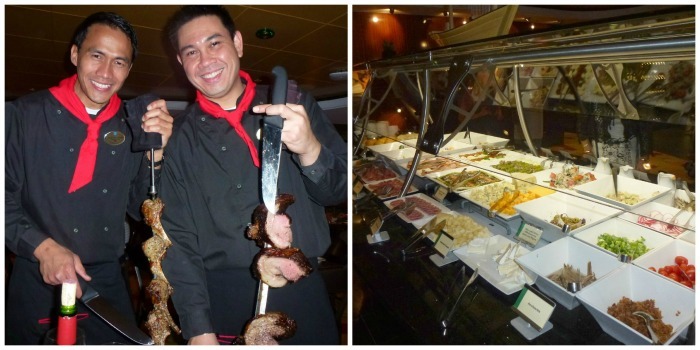 When we were on the Norwegian Pearl, the newest restaurant to the NCL group is Moderno. It replaces the TexMex restaurant on the Jewel Class ships (we didn't like the Tex Mex restaurant so we were happy about this). It had only been on the NCL Pearl for about 3 weeks and was one of the test ships for the fleet. This was without a doubt the BEST meal we had that week. Moderno is a Brazilian Churrascaria. We were excited to try it as we are all meat lovers! There is a great salad bar, and then the chefs come to each table with different types of meat right off of the cooking skewers. The lamb and beef were to die for. We loved it and can't wait to try it again! 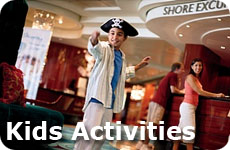 What are your favorite or not so favorite NCL cruise experiences? We would love to hear about your experiences and we know other visitors would too.